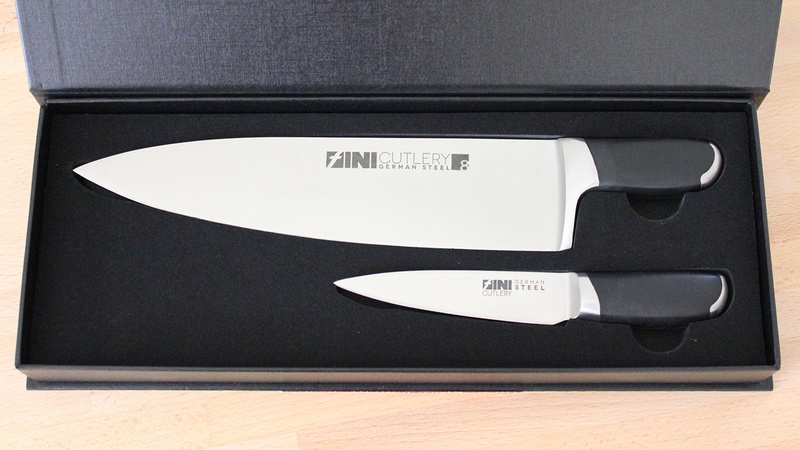 FINI Cutlery is giving our readers a chance to win one of two sets of its knives. Enter at the bottom of the post. Go to your kitchen, grab a chef’s knife, and look at how you’re holding it. Unless you’re a chef, you’re probably holding it “wrong”—according to some people anyway. The general design of the chef’s knife hasn’t changed much over the years. If something works, why change it? That’s where FINI Cutlery comes into the picture. The relatively new company designed a set of knives with handles that look a little different than your average kitchen knife. 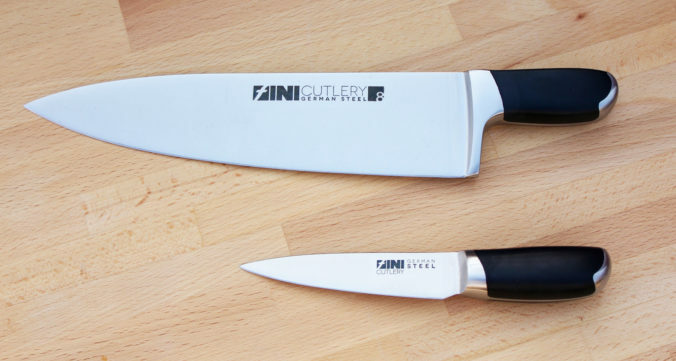 FINI Cutlery reached out to the Cutting Edge blog to review a set of two knives: a chef’s knife and a paring knife. I said yes, so they sent me a sample to review. As always my reviews are done with honesty and fairness. Let’s see how well these knives held up. Before we get to the knife, let’s look at FINI Cutlery. 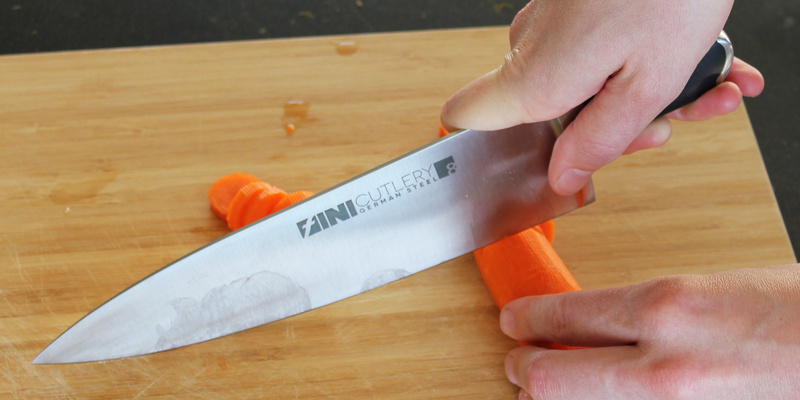 FINI Cutlery launched with a Kickstarter campaign to fund these knives on September 14, 2015. Inventor and long-time chef Peter Rigas created these knives with an eye toward proper gripping and efficiency. So the idea was to create a knife that automatically placed the user’s hand into a proper position. Apparently many out there agree with this sentiment, and the campaign was successfully funded for more than $100,000, exceeding the original goal of $40,000. There was some trouble in getting the knives out to people (as there is with pretty much every funded project), but all the orders were filled and a company was born. That’s the first thing my wife asked when she saw the knives I’m reviewing today. It’s a fair question. 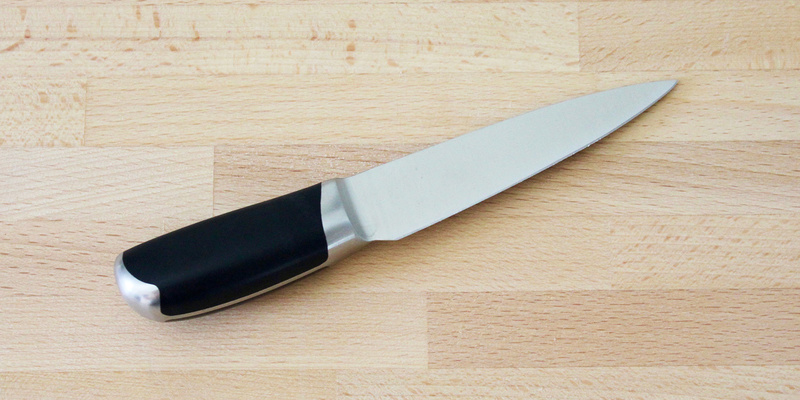 The handle is short and stubby—completely unlike all the other kitchen knives out there. I received a new set that included two knives: an 8-inch chef’s knife and a paring knife. Both of these items are currently available on the FINI Cutlery website separately, but the two-knife set is being rolled out for the holidays by November 18. The chef’s knife is $75 and the paring knife is $35. The set will cost $110 but will be offered at a reduced price of $75 for the holidays. The knives came inside a sleeved magnetic gift box with a foam insert. Along with wax protectors over the tips, this packaging provided extra protection during the shipping process. It makes a nice presentation if you’re giving the set as a gift. 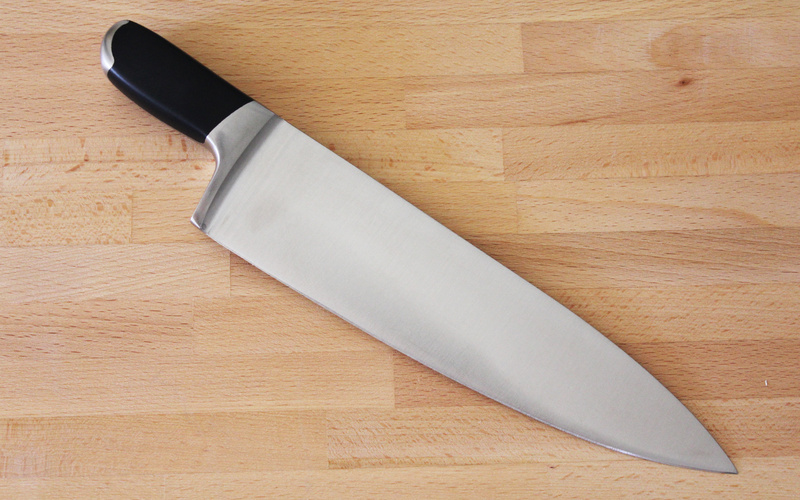 The chef’s knife features an 8-inch blade, but the overall length is only 10.75 inches. 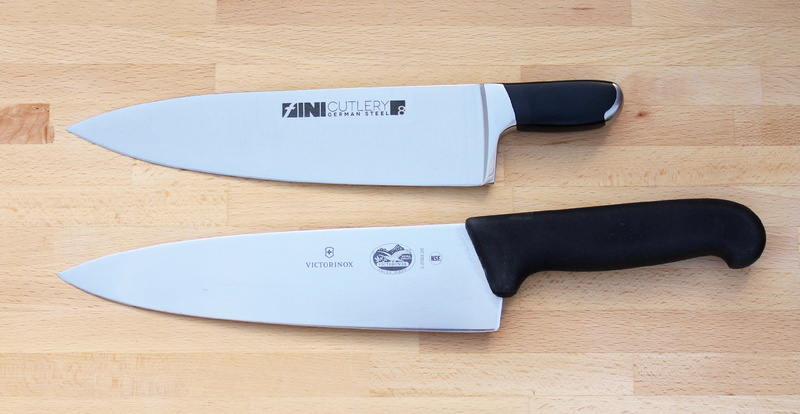 For comparison, the 8-inch Victorinox Fibrox Chef’s Knife is roughly 13.5 inches. 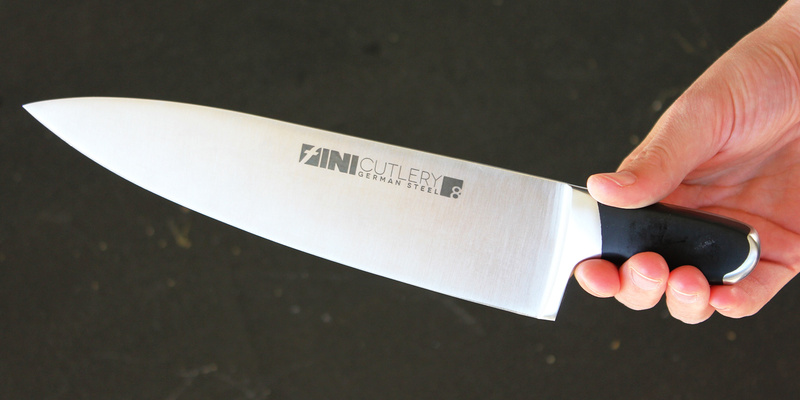 The FINI knife is a pretty typical 1.9 inches wide with a common cutting edge angle of 20 degrees. The paring knife, on the other hand, has a 3.5-inch blade and an overall length of 6.25 inches. Both knives feature 4116 German Forged Steel (more on that later) with a Rockwell hardness of 58. The handles are made from 430 stainless steel with ABS (amorphous thermoplastic terpolymer) molding. Here is a look at the chef’s knife in hand. To understand these knives, you have to understand cooking techniques. There are two main ways to hold a chef’s knife. The first is the hammer grip. This the most common way to hold a knife among amateurs because it’s the most natural. You wrap your fingers around the handle and hold it like a hammer. A finger shouldn’t go on the spine. The second is the most common among professionals and is considered the proper way. It’s called the pinch grip. You basically wrap three fingers around the handle and bolster while using your thumb and index finger to pinch the blade. Some people prefer to choke up even more and only have two fingers around the handle. Here is a good video demonstrating how to hold a chef’s knife and paring knife in a pinch grip. 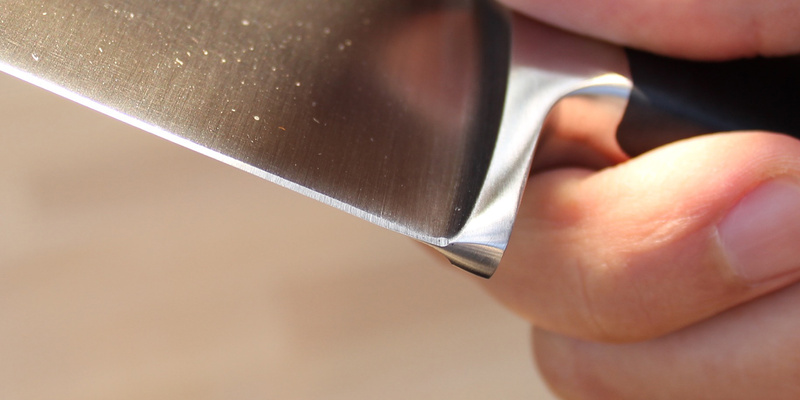 By removing half of the handle, FINI Cutlery essentially forces you to hold the knife in its proper position. Why would you want to do that? A number of reasons actually. You have more control. Choking up on the blade puts you closer to the action and makes it easier to execute consistent, precise cuts. More control means better safety. Using a hammer grip (or an incorrect grip) often leaves the knife vulnerable to wobbling side to side when cutting. Resting your fingers directly on the sides of the blade helps prevent that. The roughly 2.75-inch handle is just long enough to fit three fingers, ultimately forcing the user to hold it in the pinch grip. It’s not always intuitive to an amateur. I told my wife to hold it how she felt the most comfortable—it didn’t look like the pinch grip. Keep that in mind if you’re giving it to an amateur cook as a gift. You may have to do a little explaining. Another effect of having such a small handle is that it creates an entirely different balance in the knife. The balance point of the Victorinox 8-inch Fibrox Chef’s Knife is right where the handle meets the blade. The balance point on the FINI Cutlery Chef’s Knife is about an inch into the blade—which is right where you hold the blade in a pinch grip. This balance offered better maneuverability and comfort, though it might take a little getting used to. FINI Cutlery also touts the safety elements of the higher balance. You can rest the blade on the edge of the counter without worrying about it falling off the edge. It’s a minor but appreciated bonus. The paring knife gets its own section because it actually has a slightly different handle design. FINI Cutlery describes it as more of a pear shape, but it’s not a huge change. It seems like more of the difference comes in the fact that the bolster doesn’t extend downward because the blade is smaller. 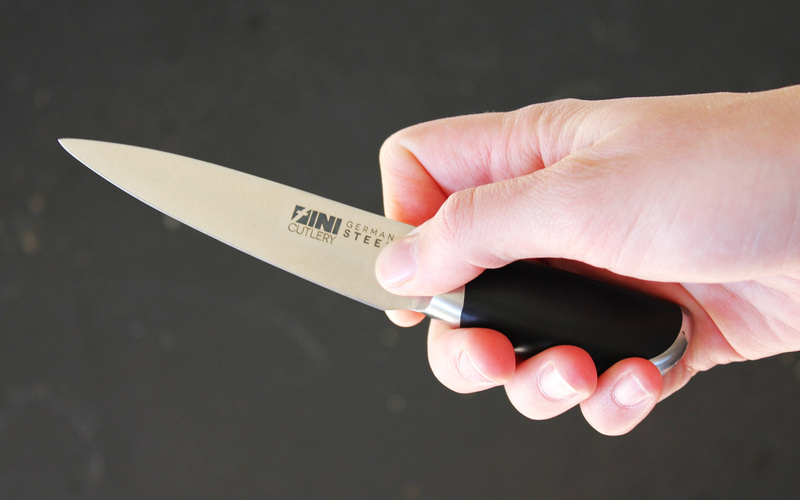 FINI Cutlery says it is optimized for holding in a variety of positions. It’s true the paring knife typically needs more grips for better versatility since it can be used for more tasks. Here’s a look at the knife in hand. Unlike the chef’s knife, the balance on the paring knife is weighted in favor of the handle. While it’s true I’m not a chef, I do know materials and what makes a good knife. We’ll start with the most important aspect: the steel. As stated earlier, these knives use 4116 steel. Let’s refer to the unparalleled zknives.com for a closer look at the 4116 steel. According to Zvi, this is a medium carbon steel frequently used in hygienic products and entry level factory knives. It’s essentially the same steel used in Wusthof and Henckels. The steel has a high chromium content for excellent corrosion resistance, and a carbon content at around 0.5% for a small amount of hardness and sharpness. The handle is made from 430 stainless steel, a highly stainless steel alloy with good formability. It creates the core of the handle, which also features ABS. The ABS inserts create a little texture and grip when holding the knife. The benefit of the pinch grip is that you don’t have to rely on the grippiness of the handle for safety purposes. While the steel is likely to dull fairly quickly, the knives came razor sharp from the factory. These knives did the paper test with ease and were hair-shaving sharp. I commend FINI Cutlery for sending out the knives this sharp. You typically have to give some knives a touch-up before using. These are said to be hand-sharpened and were impressive. It’s hard to see and doesn’t affect the performance of the knife. 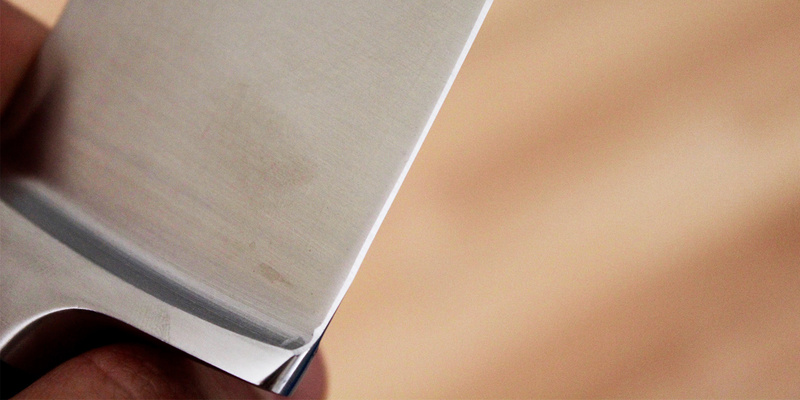 But since the knives are sharpened by hand, these types of tiny imperfections could show up. Again, I am no chef, so take this writeup on the performance of the blade with a grain of salt. The knives live up to their tagline of “less handle, more control.” Holding the knives in the pinch grip gives you better control over what you’re cutting. I’ve tackled the three types of cutting: tap chopping, rock chopping, and cross chopping. The weight and balance of the knife helped make quick work of the carrots and other items I was cutting. I also used the paring knife for cutting fruit and getting eyes out of potatoes. The knives performed as expected. The mark of a good knife is when you don’t even think about it while you’re slicing and dicing. Using these quickly became second nature. They were fast, efficient, and overall effective. However, holding the knife in a pinch grip is not very comfortable at first. This is a common complaint among amateur cooks trying the grip for the first time. It takes some getting used to and may even cause some callouses to develop where your index finger meets the spine. That’s not necessarily the fault of the knife, but if you really wanted to, you could even round out the spine. 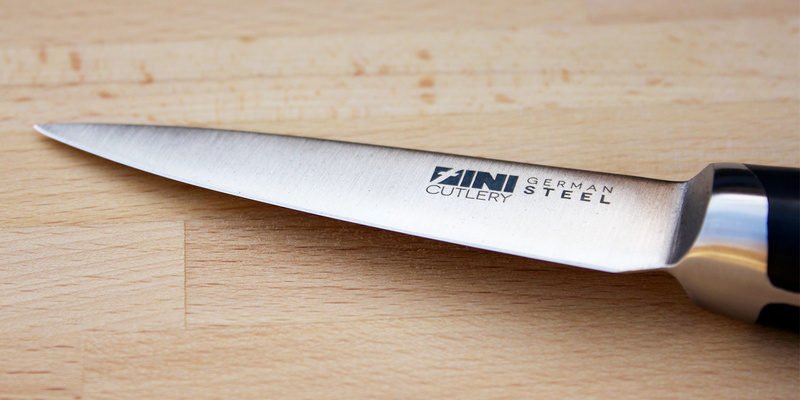 When it comes to kitchen knives, the FINI Cutlery set performs admirably. Will it change your entire outlook on cooking and food preparation? Probably not, but it will get you more into the vein of professional food prep. The handles are a clever idea that benefit amateur cooks looking to get more serious. These knives force you to use proper techniques, which will train you in the long-run. On top of that, there are some additional benefits like great balance, quality construction, and a smaller footprint that make these excellent options. You’ll have to ask yourself whether giving up some of the versatility of grip positions found in every other kitchen knife is worth it to get well-built knives that will better guide you to use proper technique with more control and better safety. If the answer is no, you can find cheaper alternatives with a more typical design. But if the answer is yes, get these knives. You can learn more about FINI Cutlery or buy the knives at the FINI Cutlery website. 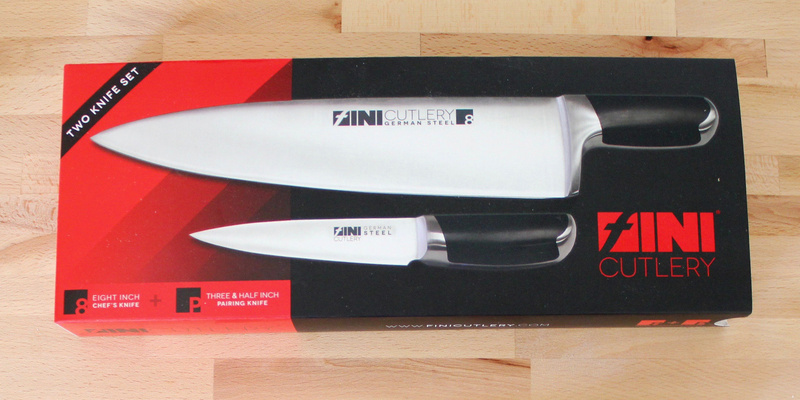 FINI Cutlery was also generous enough to give away two sets of its Holiday Knife Set I reviewed above. To enter, subscribe to our newsletter in the widget below. You can also get some bonus entries by liking FINI Cutlery’s Facebook page, following us on Twitter, or tweeting a message. The winner will be announced Sunday, November 20. Very good detailed review! Knives are shaped oddly but it completely makes sense why. I would love to have these in my kitchen. Sure, I cannot use them being paralyzed from the shoulders down at all… But they would still look good in my kitchen & they would definitely get used by someone. Never heard of these knives but have loved knives of all types and even collect old pocket blades. Always have one in my pocket.. Never knew the basics of using kitchen knives but now have a better understanding and will look up more info. . Enjoy learning sharpening techniques. These look like excellent quality and the design is certainly well thought out. Like to hold one in my hands. I have several Victorinox, Oneida, and other paring knives. I look for Henkels at estate and garage sales. Know these should succeed at the marketplace . I always appreciate such as in detailed reviews. Cutlery Chef’s Knife are an important part for the chef . Any chef will cut easily any vegetables with this knife in cooking times. I always love and read your detailed reviews. Well explained, recently searching for a Cutlery Chef’s Knife and got your review. It seems this knife will be the best knife in my kitchen. I always prefer proper edge and high quality sharpen knife, Hopefully i got it. Wow! Wonderful reviews. I really appreciate this post. It will help me a lot. Thanks for sharing.